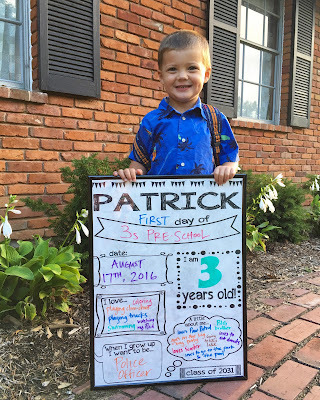 Wednesday was Patrick's FIRST official day of school -- this was a HUGE day: it was his first day that he wasn't being watched by family! Can you say GROWING UP?! 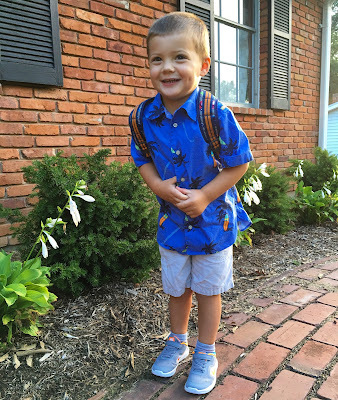 Gosh, I cannot believe he's in preschool! I'm sure I'm going to blink and he'll be in kindergarten! GAHHH! So I made that stats board (Photoshop + $3.99 frame + dry erase markers) that *I hope* he'll let me snap a pic of him with until his senior year in high school...but his first official picture was this week and he ROCKED it. 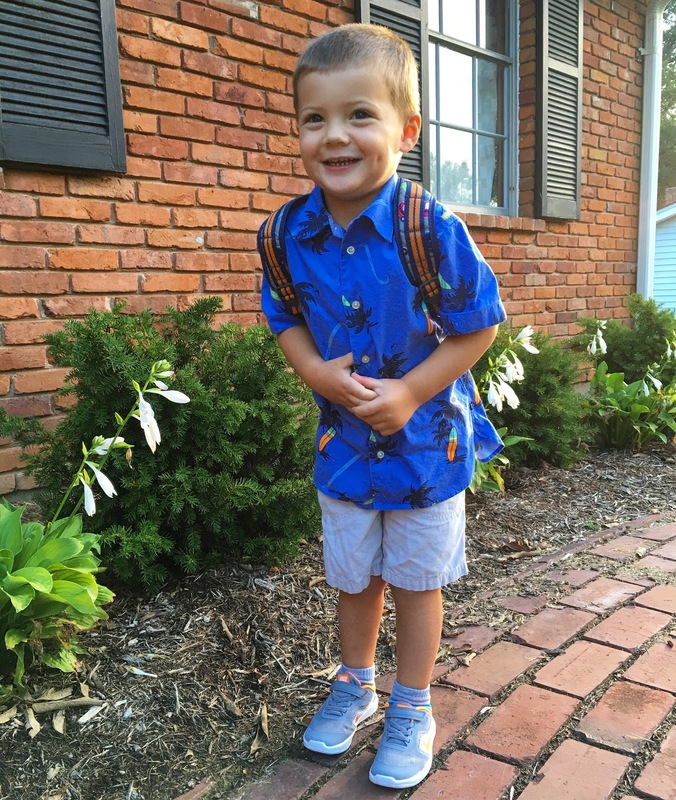 He had an entirely new outfit on: new shirt, new shoes, and new backpack! Once I finally got him up (he, much like his father, is NOT a morning person!) he was anxious and excited to get to school. I didn't snap any pics of him at school (oops) because he was a little nervous -- he goes to early drop off (like I can take him at 6:45am if I want! I got him there more like 7:30am) so he gets breakfast and gets to play before his school day starts. Fortunately his buddy Emma is in his class and school and I need to take her out for ice cream because she made it SO MUCH EASIER to drop him off! She immediately came over and invited him to play and he was much more relaxed seeing her there! Whew! And no tears on anyone's accord were shed -- all around a great day! I was SO ANXIOUS for 3:30pm to come to get him! Mike actually picked him up on his way home from work and Patrick loved that. We grilled him on how his first day went when he got home, and he was about as detailed as a 3 year old boy distracted by his train tracks would be. He said he had bananas and water for lunch (really had them for a snack), learned about Jesus, played trains with Emma, and slept on the floor under the table for rest time. He was a little cryie and whiney when he got up from nap, but shortly afterwards Mike picked him up and he was happy as a little clam! I loved hearing about his day so much -- even if it was a limited amount that he told us :) We did have dinner at my parents that night and people were asking him about his day and he flat out said, while looking up from his trucks, "I AM BUSY!!!" to respond to their questions. I don't think he was in the mood to rehatch his first day over and over again. Haha. His day today went about the same as Wednesday -- shy and apprehensive at dropoff, but once he saw Emma he was gone and had a blast until he was picked up at 3:30pm! He goes three full days a week, and I bet in another week or so he'll get in the groove and be use to waking up early (hopefully!) and going to school. I'm sure I'll blog this to death this year and for all eternity. Sorry. Not really. Doesn't he look like he's about 10?! I can't take it! 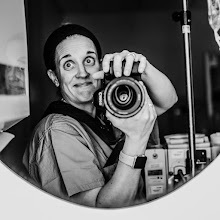 Anyways, that's about all I've got...we've got a busy weekend with a couple photoshoots for me (and maybe another birth -- waiting for my birth mama to call me!) and hosting my bestie Lauren's couples' bridal shower tomorrow night. Then school officially starts Monday! Gosh, BUSY BUSY! Anyways, have a great weekend friends!